It’s our absolute pleasure to welcome the excellent Everton writer James Corbett to This Is Not Football to tell us a bit about putting together the eagerly anticipated Everton Encyclopedia and Neville Southall autobiography, The Binman Chronicles. The Everton Encyclopedia is out soon, tell us a bit about it. It’s been a labour of love, and an idea I originally had in the mid-nineties when I was a teenager and editing a fanzine, Gwlady Sings The Blues. Back then it comprised of 100 profiles of players and I actually spoke to the club about them publishing it. That came to nothing though, and I ended up using some of the research in Everton, The School of Science, which came out in 2003. Since I did that original investigative work though, there has been an explosion in terms of historical resources available. The biggest one, obviously, is the David France Collection, and I’ve spent many an afternoon in Liverpool Library going through all sorts of fascinating documents and letters. As well as that though, there is also some invaluable stuff on the internet, like Steve Jones’s Everton Results website and Billy Smith’s Blue Correspondent. The ability to search through data electronically has been an absolute godsend. I’m grateful to both of them, as well as David France and George Orr, who up until the end of last season produced the Blueblood fanzine. With all this information available then I started again in 2009 and I’ve been able to produce a much more extensive book. You can never call something definitive, but I believe it’s probably about as close as you can get in 652 pages. There are details of every single player to have appeared for the club, with 400 full profiles and also sections concerning other aspects of Everton culture, like fanzines, for instance, or the use of the Z Cars theme. There are also hundreds of photographs in the book, many of which have never been published before. You have also been working on Neville Southall’s autobiography, how did that come about? Neville was actually the first player I ever interviewed as a journalist, for Goal magazine back in 1996, and I actually asked him then would he consider an autobiography and he said that he would, but only when the time was right. It’s taken a while for that time to come around but last year I heard from a mutual friend that he had started to speak to a few people about doing something. He had read the School of Science and liked it, and so when I met him again and had a chat we just clicked and agreed to work together on The Binman Chronicles. I finished the Everton Encyclopedia on the Friday and literally started work with Neville on the Monday. He has a reputation of being hard to deal with – how did you find him? I won’t hear a bad word said about Neville. He is well aware of how he is perceived in some quarters, as awkward or a troublemaker, and I think part of what he wanted to achieve with this book is to try and let people understand what he is really like. When he was a player he could seem bad-tempered or aloof, and he certainly wasn’t a part of the wider bar culture, but it was just because he was invested in becoming a better goalkeeper. He didn’t care about anything else. For instance, if you ask him which are his favourite games, he will obviously talk about Bayern Munich and the indescribable atmosphere, but he will also talk about a 1-0 win over Coventry, when Mark Ward scored, or some other obscure match where he actually made very few saves but was really pleased with how he organised the defence. He just sees things a little bit differently to everyone else. For someone with his reputation though, he was very conscious of treating people fairly, even those who have said some unkind things about him. Joe Royle, for instance, in his book. I’ve also been with Neville into the school where he works with kids who are excluded from mainstream education, and seen the rapport he has with them. He takes the piss out of them constantly but they absolutely love him for it. He just has this magnetism, and you can imagine how he inspired teammates in the changing room. What is your favourite part of his story? It’s probably the early stuff, about his rise up to becoming a professional keeper. It’s like Rocky, with him going for long runs along Llandudno beach and turning out for three different teams in a week as well as doing 10 or 12 shifts on a building site. He was so committed, despite never having any specialist goalkeeping coaching until he was at Bury and received some from Wilf McGuinness. You’ve come a long way since editing Gwladys, tell us a bit about your journalism. The fanzine was something I cared about, but it was also a means to an end in that it gave me a grounding that I didn’t think many other teenagers going into journalism would have. After university I then wrote about current affairs for Al-Ahram, the Egyptian state newspaper and I only came back around to football following the publication of The School of Science. Since then though I’ve covered the game for the likes of The Guardian, The Sunday Times and World Football Insider from all around the world, including Palestine and the World Cup in South Africa. I also had the honour of working for three years on the Observer Sports Monthly, what I think was the best general sports magazine the UK has ever had. Our equivalent of Sports Illustrated. How do you think history will treat the present Everton era, of David Moyes and Bill Kenwright? I think this is a seminal period for football as a whole, as we move ever closer to a US model of a closed shop operated between a small number of franchises who see themselves as being involved in the entertainment business as opposed to a sport. There’s certainly no natural justice in football – what has happened at Manchester City and to a lesser extent Chelsea is just disgusting. Against that background I think it’s difficult for Kenwright to operate, although it is difficult to believe that we’ve had no one at all interested in buying the club in the last five or six years. That said, how many takeovers have been unqualified successes? Liverpoool under Hicks and Gillet? Glasgow Rangers? Blackburn Rovers? The Venkys are very wealthy people, but they simply know nothing about football. Even Aston Villa and Sunderland, who have pretty progressive owners, have seen no success. The thing you always come back to with Everton is wondering where a new owner could make a return on their investment, especially given the need for something to be done with Goodison. What does annoy me is when people make out that the administration at Everton are somehow corrupt or stupid, because they are not. We would all do some things differently, but I know for a fact that behind the scenes people work really hard at the club. They might display a bit of a siege mentality at times, but that’s understandable too. As for David Moyes, history will judge him very kindly, and rightly so, as he’s an outstanding manager. I honestly believe that had he managed Everton at any period up until the late nineties then he would have won or at least challenged for the title. 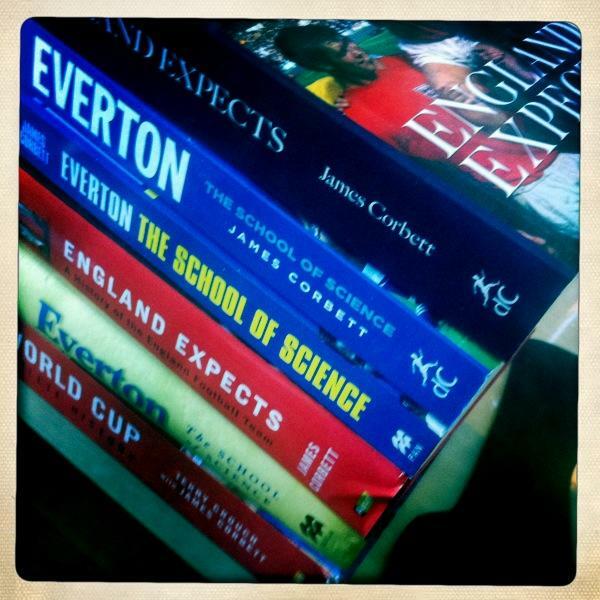 What’s next for you, any more Everton books? No, I’m going to take a break now after doing two back-to-back and return to journalism for a while. The Everton Encyclopedia is released on September 24th and Neville Southall, The Binman Chronicles is out on August 13th. For more details and to pre-order both visit the deCoubertin books website. Posted on July 24, 2012 August 15, 2012 by mob1971	This entry was posted in Interview and tagged Books, Everton, Football, Interview, James Corbett. Bookmark the permalink.